Plan your flights manually with several import and export options or even synchronize the flight plan with Project Magenta or Aerosoft Airbus products. In this area the current loaded flight plan is displayed. It starts with the departure and arrival airport as well as the next waypoint in the flight plan from the current aircraft position together with its distance and the total remaining distance. 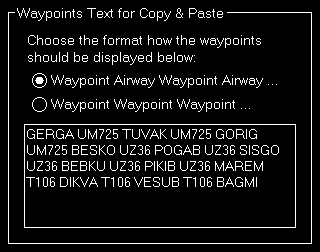 Below that a list of all flight plan points is displayed together with the airway if one is used as well as the true and magnetic heading plus the distance to the next waypoint in the list. Right-click on any waypoint to either delete it, move it up or down, center the map on this point or completely clear the plan again. Note: Keep in mind that editing the flight plan is only possible when you are in the manual flight planning mode. Select this mode to create and edit the flight plan manually. You can load, save or delete flight plans here. To make it easier to find the right flight plan before loading it important details like departure and arrival airport together with the selected runway are displayed. Additionally the title and the cruising altitude of the flight plan can be changed in this section. You can define here if and which kind of airways should be used for flight planning. Additionally you can choose if also SIDs and STARs should be used. Note: The airway options you choose here are also used for the visual flight planning with the flight plan mode on the Map module. First you can set the departure and arrival airport here as well as reset the whole flight plan again. Additionally FS-FlightControl can calculate an airway route between the departure and arrival airport for you and you can remove all waypoints from the current flight plan again. Finally you can also open the import and export dialog here. Note: Actions like adding a new waypoint to the flight plan as well as setting the departure and arrival airport can be done on the Map module in the flight plan mode, too. Beside creating a flight plan manually, you can also synchronize the flight plan with third party products. Note: Additional parameters need to be entered in the Third Party settings before synchronization can be enabled for these third party products. Note: For synchronization with flight simulator itself FS-FlightControl cannot detect an already loaded flight plan, but only a flight plan change in flight simulator while FS-FlightControl is already running and connected. Note: For Wilco/FeelThere synchronization you need to manually save the FMGC state in the MCDU via Data/SAVE FMGC. After saving the FMGC state the flight plan data is automatically synchronized to FS-FlightControl. This dialog provides you with various options to import flight plans from external applications. Click on this button to import a flight plan from Prepar3D, FSX or FSW (format .pln, FS2004/FS9 is supported as well). In the file dialog popping up just select the flight plan file and open it. Click on this button to import a flight plan from X-Plane (formats .flp, .fml and .fms) . 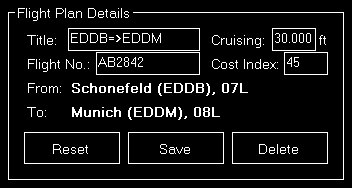 You can also import flight plans from PMDG (formats .rte and .rt2) with this button. 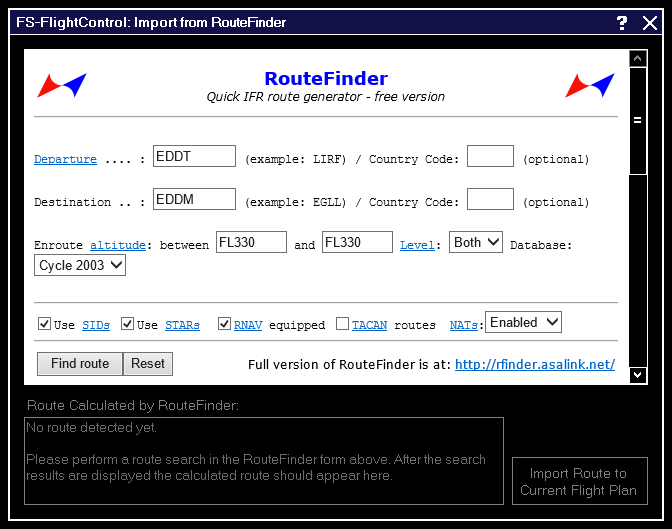 There is also an option to directly import a flight route from RouteFinder. 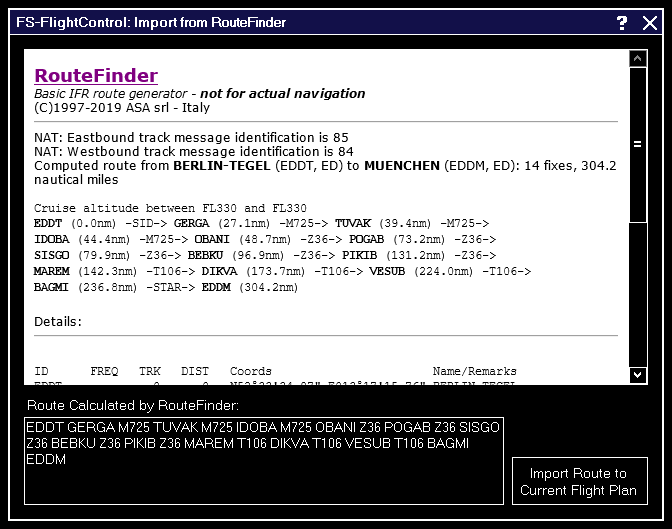 First you will see this dialog including the RouteFinder website. All relevant fields like departure and destination as well as airway level selection and whether to use SIDs/STARs or not should be pre-filled already. This way you normally only need to click on the button Find route. After the search has completed this page should be displayed. If a route was found the extracted route will be automatically displayed in the text field below. Then just click on the button Import Route to Current Flight Plan to import it. Note: It can happen that the RouteFinder website is overloaded and just displays something like Too many requests at once on the server. In this case just hit the [Back] link and search again till a route is returned. Use this section to easily import waypoints to your flight plan from websites like SkyVector. First select if you want to import just a list of waypoints separated by a space (in this case FS-FlightControl will find out the airways itself) or the list includes the airways itself already alternating with the waypoints. Then just copy & paste the waypoints list into the text field and click on the button Add Waypoints to Current Flight Plan. Note: Additionally it is possible to write the ICAO code of the departure and arrival airport at the beginning and end of the waypoints list. When you are also using PFPX you can import a scheduled flight as flight plan. Just select the desired scheduled flight from the list and click on the button Import from Scheduled Flight. Note: Only flights with a defined flight number and airline name are available for import. If you have installed a ProSim product you can also import the ProSim company route as flight plan. Just select the desired company route from the list and click on the button Import from Company Route. You can even use the button Delete to clean-up your ProSim company routes from within FS-FlightControl. If you have installed an Aerosoft Airbus product you can also import the Aerosoft Airbus company route as flight plan. If you have installed an Wilco/FeelThere Airbus product you can also import the Wilco Airbus company route as flight plan. This dialog provides you with various options to export flight plans to external applications. Click on the button Save as Prepar3D/FSX/FSW Flight Plan to export a flight plan to a file compatible with Prepar3D, FSX and FSW (format pln). In the file dialog popping up just select a file name and save it. Alternatively you can also send the flight plan directly to Prepar3D, FSX or FSW with the Load Directly in Prepar3D/FSX/FSW button. Note: Directly loading flight plans to Prepar3D, FSX or FSW requires that you have set the documents directory of the simulator first. Click on the button Save as X-Plane Flight Plan to export a flight plan to a file compatible with X-Plane (formats .flp and .fms). In the file dialog popping up just select a file name and save it. 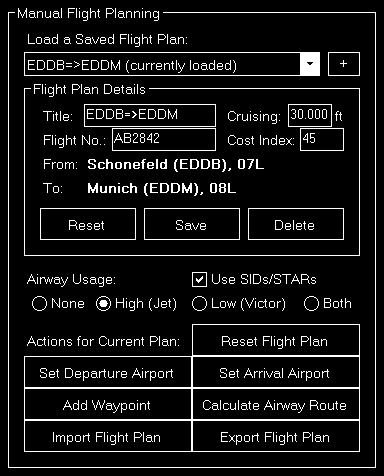 You can also use the button Save as PMDG Flight Plan to export a flight plan to a file compatible with PMDG (formats .rte and .rt2). In the file dialog popping up just select a file name and save it. Use this section to easily export waypoints to other applications via copy & paste. 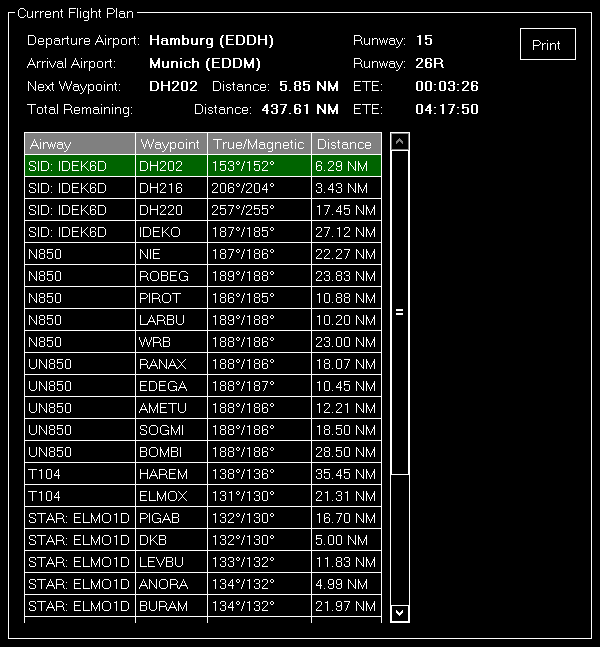 First select if you want to export just a list of waypoints separated by a space or the list should include also airways alternating with the waypoints. 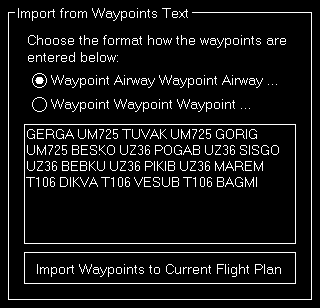 Then just copy & paste the waypoints list from the text field into any other application you wish. If you have installed the Flight Sim Labs A320-X product you can also export a flight plan directly to the MCDU. Just click on the button Export to MCDU to do so. Note: This export will only work if the Flight Sim Labs AOC Service is running (check if a directory \FSLabs\AOCService\Uplink\ exists below the flight simulator installation directory). Additionally the A320 needs to be loaded in flight simulator and electrical power has been established. If you have installed an ProSim product you can also export a flight plan to ProSim. 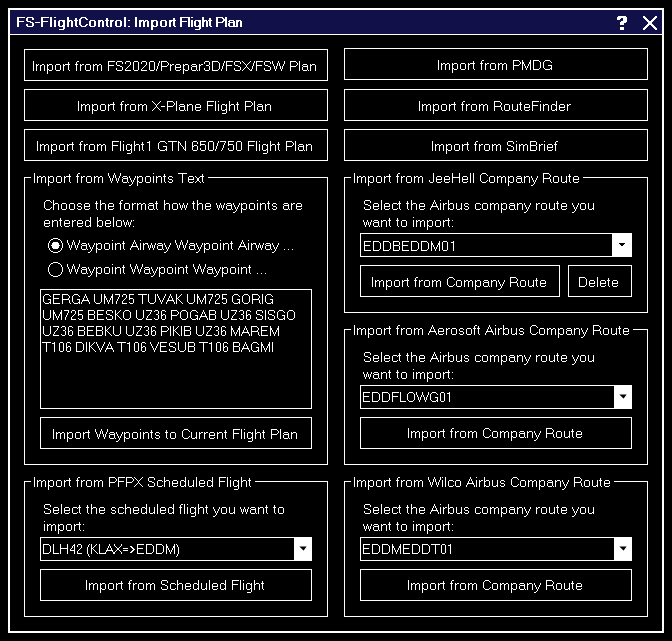 Either you use the button Directly Load Flight Plan in ProSim FMS or you enter a title for the company route with exactly 10 characters and click on the button Export as Company Route. Note: Also after an export as ProSim company route you have the option to load it directly into the FMS. If you have installed an Aerosoft Airbus product you can also export a flight plan as Aerosoft Airbus company route. Just enter a title for the company route with exactly 10 characters and click on the button Export as Company Route. 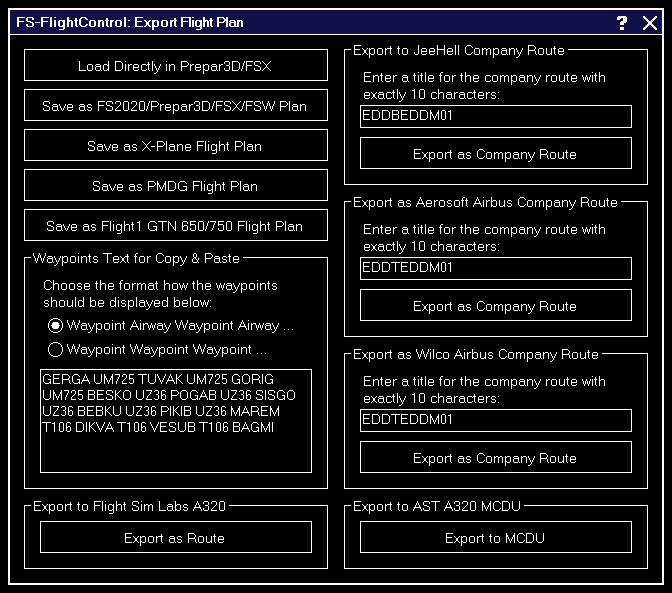 If you have installed an Wilco/FeelThere Airbus product you can also export a flight plan as Wilco Airbus company route. Note: As Wilco stores the company route data within a directory that requires administrator permission for writing, you need to start FS-FlightControl as administrator to be able to export a flight plan as Wilco Airbus company route.